Any rib lovers out there? We decided on ribs for our Super Bowl Sunday meal this past Sunday. They are great football feasting food! Hubby learned a great way to make them. The secret to making them tender and fall-off-the-bone wonderful is in boiling them first in Coca-Cola. After boiling them for a couple hours, you drain them, put them in a container, drench with your favorite barbecue sauce, cover tightly, and marinade overnight. When you are ready to eat them, you simply throw them on the grill, or in our case, Hubby likes to throw them in our Pit Barrel Cooker and smoke them a bit. 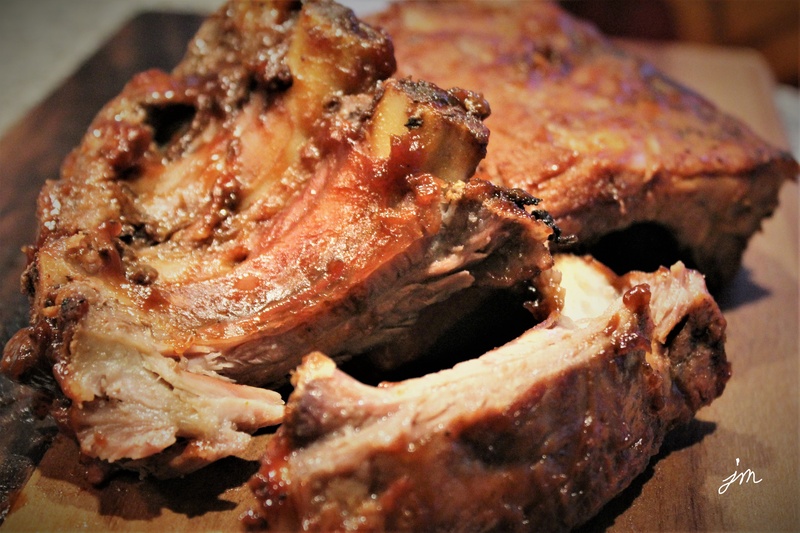 In a half hour, you have the most amazing tender, fall-off-the bone, juicy pork ribs you’ve ever eaten. 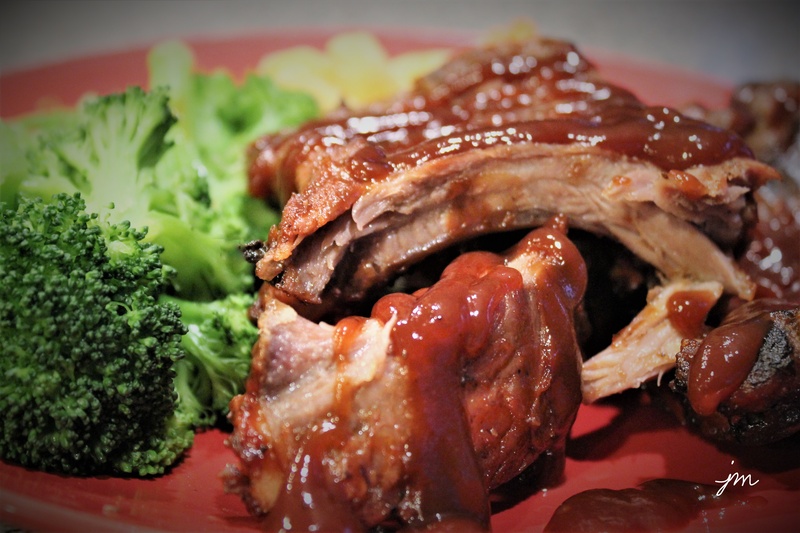 I know many folks have their own way of making ribs with varying techniques – dry rubs, wet sauces, marinades, etc., but I have not found a way I like better than this simple full-proof recipe. Hope you’ll give it a try and let me know. Cut ribs into 4 pieces. Put in large pot. Pour Coca-Cola over ribs until they are completely covered. Put lid on pot, and bring to boil. Reduce heat, and simmer about an hour or so until they are fully cooked. Remove ribs from pot, and discard Coca-Cola. Place ribs in airtight container. Cover with barbecue sauce and lid. Marinade overnight or for at least 6-8 hours. A half hour before ready to serve, place on grill or in Pit Barrel Cooker and grill/heat through. Jodi, I have a friend who recommended this. Isn’t it amazing that it has Coke? This recipe sounds magnificent! YUMMM!! Sounds like your Super Bowl dinner was amazing!! 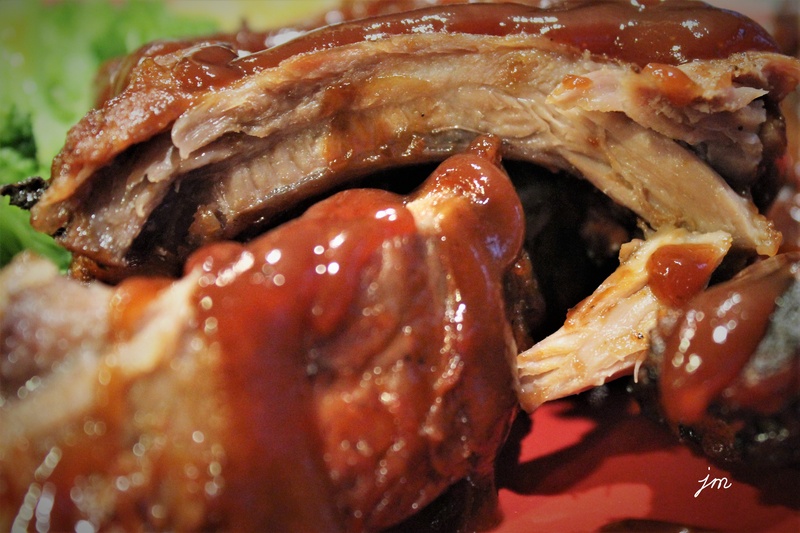 Ok saucy Jodi, you did it again…touchdown with the ribs. What a great idea for the marinade. Happy day! yeeeeuummy!!! Looks totally delicious Jodi! wait until you see how amazing it turns out! Icy roads here too today and schools closed. I’ve heard good things about that BBQ sauce too! Oh sounds yum, I used to have a recipe I made at Easter for baked ham using 7-up. I think I’ve heard of that too. What does it do to the ham? Keeps it moist I think, and may help the mustard brown sugar glaze. I know that I had to baste it, several times during cooking with the 7 up in the bottom of the baking pan. The ham cames out lightly browned with a rich sweet, mustard flavor on the outside, and so juicy melt in you mouth inside. Sandwiches afterward were as rewarding as turkey sandwhiches from Thanksgiving. Wow – sounds like a must try! This sounds like a great technique!